A variety of dances from Contemporary Dance and Dance Theater to Belly Dance, and more. Creative Body Alignment workshop is led by guest teacher Carol Loud. Carol has thirty years' experience in performing and teaching dance, sensory integration and body alignment based on the work of Mabel Elsworth Todd and Andre Bernard. This is an approach to freeing the human body of muscular stresses that is unique in its reliance on the creative mind to re-educate neuro-muscular patterns for balanced alignment and ease of motion. This training can be put to work immediately in daily living, dance, athletics, performing, teaching and healing. Ten of the best choreographers in the East Bay present an afternoon of performances at Western Sky Studio in Berkeley; a variety of dances from Contemporary Dance and Dance Theater to Belly Dance and Contemporary Persian Dance. The Ruth Botchan Dance Company will celebrate its 35th Anniversary with a concert, "Dances of Life, Love and Loss", on September 23 and 24, 2017, Saturday evening at 8 p.m., and Sunday at 7 p.m. 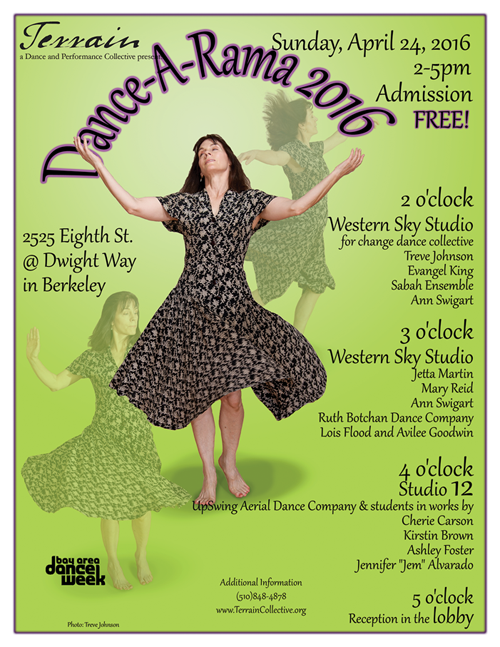 The program, will take place at Western Sky Studio, a center for dance and performance in Berkeley. There will be three dances choreographed by Ruth Botchan on the program, as well as pieces from choreographers Mary Reid, Jetta Martin and Claudine Naganuma. Ruth’s newest piece is choreographed to The Italian Concerto, a breathtaking piece for piano composed by J.S. Bach. The third movement, performed for the first time on this concert, explores facets of grief, an experience that is at once deeply personal and universal, showing how life rushes on around us as our own lives stand still to mourn. Also on the program will be two revivals. “The Second Half of Joy” is a trio reflecting on stages of a woman's life, with original music composed by Sarah Michael, preceded by a poem by Emily Dickinson from which the piece gets its title. “The White Stork” gets its title from a beautiful, newly restored synagogue in Poland where the company performed in 2008. The synagogue miraculously survived the Nazis, but nearly fell to ruins after WWII. Mary Reid, who has been sharing concerts with Ruth Botchan for nearly twenty years as a member of Terrain, a Dance Collective, and whose dances often have a gentle humor, will present a piece inspired by the memory of listening to favorite record albums and dancing like no one else is in the room. Jetta Martin, is a member of Ruth Botchan Dance Company and a choreographer as well. Her piece will focus on the transitory nature of our lived experience. Claudine Naganuma’s new solo work The Cloud and the Little Flame is inspired by Thich Nhat Han’s lectures on letting go. Award winning designer and long time collaborator Cheryl Koehler will be designing costumes for her new work. A group of the best choreographers in the East Bay present an afternoon of performances at Western Sky Studio in Berkeley; a variety of dances from Contemporary Dance and Dance Theater to Belly Dance and Contemporary Persian Dance. Creative Body Alignment workshops are led by guest teacher Carol Loud for one week-end in July. Carol has thirty years' experience in performing and teaching dance, sensory integration and body alignment based on the work of Mabel Elsworth Todd and Andre Bernard. This is an approach to freeing the human body of muscular stresses that is unique in its reliance on the creative mind to re-educate neuro-muscular patterns for balanced alignment and ease of motion. This training can be put to work immediately in daily living, dance, athletics, performing, teaching and healing. The 2-day workshop is open to everyone, regardless of experience. Terrain will mark its 16th anniversary on Saturday and Sunday, May 11 and 12 with a weekend of performances entitled Timeless Dances. Veteran choreographers and collective members Ruth Botchan, Jim Beatty, Mary Reid, and Ann Swigart will present new works on love, loss, aging, art and...baseball. Photographer Treve Johnson will exhibit his unique photographs in the lobby. Terrain, founded in 1997, is an extraordinary performance collective, both for its longevity and its diverse veteran artists. 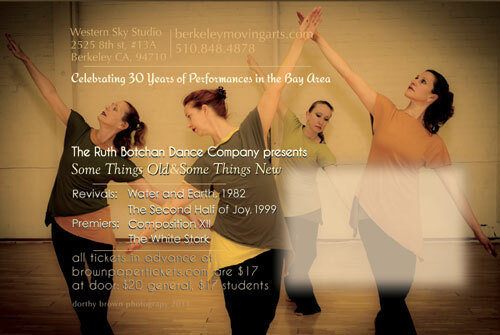 The Ruth Botchan Dance Company will perform two pieces. Composition XII, inspired by the paintings of Wassily Kandinsky and is a lively tribute to the great artists, composers and choreographers of the twentieth century who showed us new ways of seeing, hearing and dancing. Slow Movement, a premiere inspired by Ruth Botchan’s 98-year-old mother takes a look at old age. Jim Beatty creates dance theatre pieces with humor and feeling. He willperform Paigisms – The Wit And Wisdom of Satchel Paige, the legendary baseballpitcher, and Its Never Too Late To Wait - The return of TimeFly. Treve Johnson, photographer and Terrain member, will display several of his dance panoramas as well as copies of his book Timeless Dances Volume One, and a short video presentation based on images in the book. Mary Reid will perform a dance that combines her love of dance-theater withgesture and pedestrian movement. Ann Swigart -- dancer, choreographer, and musician -- will perform two pieces.What of the Mother is a dance that depicts the grief of losing a child to war, set inthe Civil War era. This State is a co-creation with fellow Terrain member Mary Reid. It is a dance of joy, love, and friendship. WHEN: Saturday, May 11 at 8pm & Sunday, May 12 at 7pm. Come join the fun and experience some of the East Bay’s most exciting choreographers in various studios at the vibrant Eighth Street Artists’ Center. Terrain Dance and Performance Collective present an informal performance marathon. From contemporary dance to performance art, Indian Dance to Belly Dance, Aerial Dance to Contemporary Persian Dance and More, there’s a different show every hour. UpSwing Aerial Dance Company and students FLY! 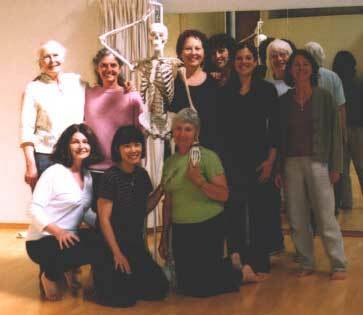 Creative Body Alignment workshops are led by guest teacher Carol Loud for one week-end in June or July. Carol has thirty years' experience in performing and teaching dance, sensory integration and body alignment based on the work of Mabel Elsworth Todd and Andre Bernard. This is an approach to freeing the human body of muscular stresses that is unique in its reliance on the creative mind to re-educate neuro-muscular patterns for balanced alignment and ease of motion. This training can be put to work immediately in daily living, dance, athletics, performing, teaching and healing. "Some Things Old and Some Things New"; our 30th anniversary concert will consist of two revivals and two premiers. The revivals are "Water" and "Earth" from a suite of dances choreographed in the 1980's and "The Second Half of Joy". First performed in 1999, this piece is a reflection on growing older and the stages of life. Most exciting are the new dances. "The White Stork" was inspired by a visit to The White Stork Synagogue, in Wroclaw, Poland, newly restored after falling into ruins after World War II and which is now a symbol of renewal for the community. “Composition XII” was inspired by an exhibit of paintings by Vassily Kandinsky seen during a trip to New York City when the company performed at a celebration of the Centennial of the birth of Ruth’s teacher Erick Hawkins. It is a reflection on the great revolutionary artists of the twentieth century, and while it is ‘abstract’, it is an expression of the joy and delight of moving. We hope you'll join us to celebrate this milestone, and share in the completion of the circle of performers and audience, dancers and watchers, which is what it's all about.